Dartmouth-Hitchcock's Marketing team worked with the Children's Hospital at Dartmouth-Hitchcock's (CHaD's) Child Life Program to improve the inpatient menu for pediatric patients. The intent of the redesign was to help non-verbal patients point to a photo of what they wanted to eat and to entice other children to be more interested in eating. 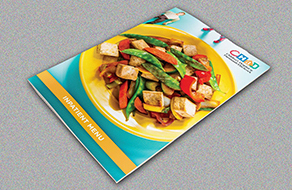 Patients report that they love the colors, the playfulness of the menu and size because it's easy to hold. “We Hear You” is a series about and for our patients and their families. Have you offered feedback or given us a suggestion to improve and wondered if we ever acted on it? We want you to know that we are listening and to share what we are doing to better meet your needs. We invite you to keep your suggestions coming by using our feedback form.